We specialize in the service of every make and model vacuum pump from all manufacturers including: Varian, Agilent, Pfeiffer, Edwards, Leybold, and Alcatel. We can even fix those off-shore manufactured pumps. With our extensive history in the vacuum industry we can source the parts for all makes and models no matter how obscure or obsolete. AltVac Sales and Service is a full service vacuum pump repair shop. All work is done in house by the most skilled technicians in the business. We fix vacuum pumps and related products, including motor repair, filter system overhaul and accessory replacement. Unlike many repair facilities in Canada our focus is the vacuum industry only. AltVac Sales and Service was established to service vacuum equipment for institutional, industrial and scientific applications with the best and most reliable pricing and turn around times in the business. We strive to be the most professional repair company in Canada. AltVac Sales and Service has the ability to supply bulk parts orders for most makes and models of vacuum pumps. If you have technicians on staff we would be glad to offer support in the way of kit parts and service knowledge. All of our parts will be sold in bulk quantities, ensuring that you get the best price in the industry. 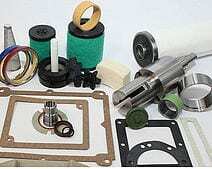 Let’s say you replace seals and gaskets on your pumps, instead of purchasing individual parts at a high cost you can buy only the parts you need in bulk and save a great deal of money. Our knowledgeable teem can guarantee you receive the parts you need for your pump at the best price possible. AltVac Sales and Service offers a full stock of lubricating fluids. AltVac Sales and Service fluids offer an advanced formula, long life, anti-wear properties designed for high performance systems to provide excellent operating and maintenance benefits for increased productivity. Our fluids are blended to provide the best performance in your application and are sold in 4L jugs and 20L pails. Contact Us for more info.